Ideal for families! Our house is located in Lefokastro seafront and just 50 meters from the nearest bathing beach. But you can also swim right in front of the house. Lefokastro is located approximately 30 km south of Volos between Afisos and Kalamos and is not touched by Massentrourismus. In Lefokastro there are few small accommodations for travelers, the quiet and the Original Search. Iro House is located in the settlement, and right by the sea and only 50-70 meters from the nearest bathing beach. In Lefokastro there are three taverns, all of which are recommended. Shops can be found in Afisos about 2 km or Argalasti about 9 km away. Please note: a car is necessary. Parking: Parking near the house (150 meters). Beach: The nearest sandy beach is 50 meters away. In about 300 m is a very beautiful solitary Sandtrand. In about 600 m is the beach Agia Efthimia and in 1.8 km of the beaches in Afissos. Each apartment is modern and tastefully decorated and has a bedroom with a double bed or twin beds and a living room with two additional beds and a kitchen-nook, which is separated by a breakfast bar. 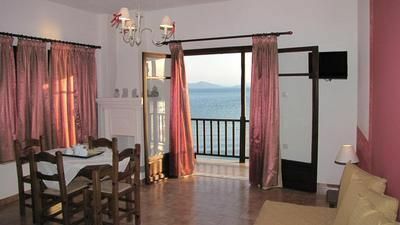 The apartments also have a shower / WC, air conditioning, flat screen TV and balcony with garden furniture and sea views.